As US Pres. Barrack Obama set foot on Philippine soil today, Migrante International joined other sectors in a big protest rally in Manila to condemn the US government for preying on the Filipino people and the country’s resources. Filipinos around the world also condemned the Aquino government for its “outright and shameless puppetry and subservience to the US neoliberal agenda, at the expense of the Filipino people, particularly overseas Filipino workers,” according to Garry Martinez, Migrante International chairperson. Yesterday, Filipinos in Hong Kong, Australia, Canada, South Korea, Japan, Saud Arabia, United Arab Emirates, Europe and the United States held simultaneous protest actions and flag-burning activities to protest Obama’s visit to the Philippines. 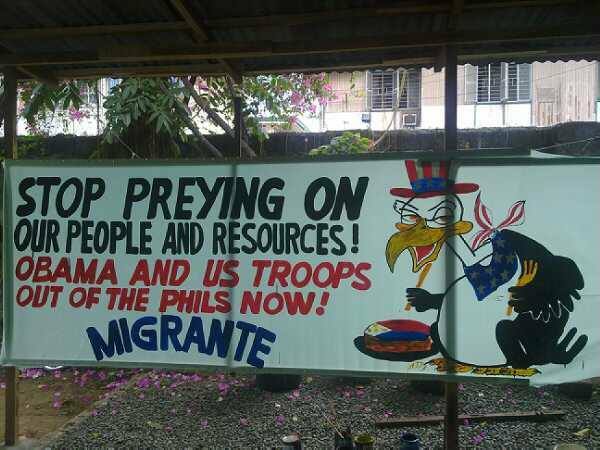 Chapters and members of Migrante International are also expected to participate in various multisectoral rallies and protest activities worldwide today and tomorrow, April 28-29, dates of Obama’s visit in the Philippines. “The message of Filipinos around the world is loud and clear. Obama, you are not welcome in the Philippines. Stop plundering our resources and exploiting our people. US troops are not welcome in the Asia Pacific. US bases should be kicked out in other parts of the world,” said Martinez. The US presently has 265 bases in 41 countries, Logistics Agreement with 76 countries and Status of Forces Agreements with 121 countries. In the Philippines, the Visiting Forces Agreement is set to be further reinforced by the Aquino government signing into the Enhanced Defense Cooperation Agreement (EDCA) “which will virtually transform the whole Philippines into one big US military base”, he said. Martinez said that cha-cha will pave the way for the signing of the US-PH Transpacific Partnership in trade which will further aggravate forced migration and the labor export policy. He said that under the Aquino administration, the number of OFWs leaving the country increased from 2,500 daily in 2010 to 4,884 in 2013. “This is the result of massive unemployment, low wages, landlessness and privatization of social services under the Aquino regime. Obama’s visit will further prey on the country’s worsening economic situation brought about by Aquino government’s unreformed policies,” he said.